Last year I tried the Keto Diet and really liked it. My clothes were looser, my face was less puffy, and I felt great. I ended up stopping eating Keto because I caused myself a little electrolyte problem and landed in the ER. But until that point, I was doing GREAT on it! 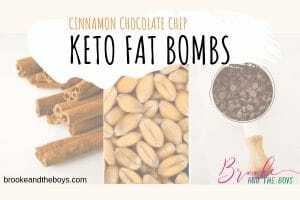 One of my favorite Keto treats was…the Keto Fat Bomb. Um. Duh. 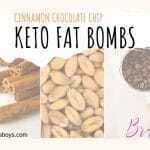 There are a million recipes out there for Keto Fat Bombs. There are now whole “cookbooks” – like lots of them – with just Fat Bomb recipes. I liked a lot of versions I found on the internet, but enjoyed tweaking to make my own decadent concoction! Sometimes I add walnuts, added some chopped peanuts, or tried nutmeg. But this recipe as it is tends to be the one I go back to! SCRUMPTIOUS! Chocolate Chip "cookie dough" Fat Bombs with Cinnamon? Yes, please! These fluffy and light fat bombs are perfect to satisfy the desire for a sweet treat when on Keto! Freeze the Fat Bomb Balls to firm up again. 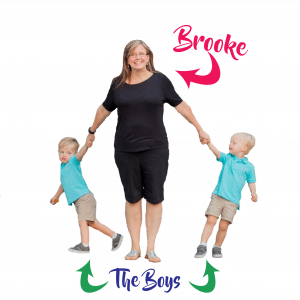 These can be stored in the freezer or the refrigerator! Let the Cream Cheese and Butter sit out for a bit to soften. It makes it much easier to cream together. I have used both a fork and a hand mixer for this recipe - both worked fine for me. Coating your scooping utensil with a bit of Coconut Oil may help. I usually store some in the freezer and some in the fridge - eat them out of the fridge and replenish from the freezer. I've also added Chopped Walnuts, Nutmeg with great success! Resist eating too many at once! They are TASTY!! If you are eating Keto and loving it, I’d love you to post your favorite Keto meals on my Facebook Page. I’m always looking for new things to try. What else would you put in these Fat Bombs to make them delicious?